Walgreens drug store clerks, pharmacists, and pharmacy aides performed numerous job-related duties. These duties can include operating the cash register, stocking shelves, filling doctors’ prescriptions, and recording every medication that is dispensed to customers. Walgreens workers can be exposed to numerous workplace hazards while on the job. The Walgreens supervisor and store manager have a duty to maintain a safe work environment and provide employees appropriate PPE (personal protective equipment) when necessary. The employee’s boss must ensure the workers file appropriate procedures when handling medication products and pharmaceutical drugs that are known to pose substantial health hazards. The management and supervisors must teach employees procedures and policies on how to handle an emergency involving dangerous medications. Staff members inside a Walgreens often lift heavy boxes, clean up spilled liquids, use ladders, and face job-related violence. Some drug stores have inadequate ventilation and lighting systems or malfunctioning equipment that could pose a significant threat to the health and well-being of every worker and customer in the store. If you or a family member was injured while working at Walgreens, you are likely entitled to workers compensation benefits. Contact the workers compensation attorneys at Rosenfeld Injury Lawyers LLC for more information and a free review of your legal rights and options. Chemical Hazards – At some drug stores, the pharmacist will compound medications following the prescription that was written by the physician. In some situations, the compound formulated with different chemicals can cause an interaction that could pose a significant risk to the pharmacist, pharmacy aides, and other assistants. To remain safe, the pharmacist must provide every employee safe working procedures on how to react to a medication spill, pharmaceutical mishap, or exposure to a hazardous substance. 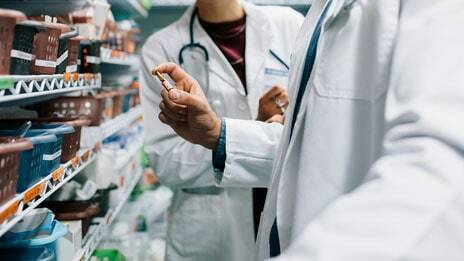 Biological Hazards – Pharmacists and pharmacy aides are often exposed to contagious diseases by sickly customers picking up prescriptions at the drugstore. Every worker and the drugstore should follow proper protocol to eliminate the risks involved in exposure to infections. The management should ensure that the facility has a proper ventilation system that provides adequate clean air to minimize exposure to biological hazards. Musculoskeletal Hazards – Standing one position all day, performing routine procedures and bending, stretching, reaching and squatting could cause serious musculoskeletal disorders. The physical demand for performing routine, repetitive motions could develop into chronic musculoskeletal problems by standing in an awkward position for hours at a time every day. Ergonomic Hazards – Standing on a cushioned map, add a non-strip material to the floor and using the best equipment and tools necessary to lift and transport heavy merchandise, boxes and packages can reduce serious injuries caused by poor ergonomic processes. RMI Hazards – Repetitive movement injuries (RMI) are a critical concern in nearly every workplace, including the pharmacy at the local drugstore. Performing routines at work using the same repetitive motion for days, weeks, months and years can cause problems with the hands, wrist, fingers, elbows, forearms, shoulders and neck. Without intervention, severe RMI can lead to carpal tunnel syndrome. Psychological Hazards – Working long strenuous hours without days off can create psychological hazards and disrupt a normal job environment due to a heavy workload. Many psychological hazards can be avoided by working in well-ventilated areas that are cooled, and heated to a comfortable temperature to ensure that the employees remain alert while filling in dispensing prescriptions. Physical Hazards – The pharmacist and pharmacy aides work with sharp instruments including injection needles that could pose significant physical injuries that can be avoided by following safety protocols. Workplace Violence and Aggression – The open exposure of the drugstore on every corner has the potential of workplace violence when criminals enter the pharmacy looking for drugs or money. Other times, the pharmacist and Walgreens workers exposed to an aggressive or agitated customer hoping to get medications without a prescription. In dangerous communities, the local pharmacy is often the ideal location for criminals in search of drugs or cash. Burglaries and robberies at Walgreens, CVS, Rite Aide and other drug stores often result in serious injuries or death through assault when the robber shoots or attacks customers and workers. Case 1: Jersey City, New Jersey – A shooter inside a Walgreens drugstore killed a 7-month veteran of the New Jersey Police Department after stating to a customer that he was “going to be famous." The 23-year-old police officer was ambushed when he pulled up in his patrol car. Immediately after shooting the officer, responding police shot and killed the gunman. Case 2: Tallahassee, Florida – The mother of a slain Walgreens worker is suing the company over the stabbing death that took the life of her daughter. The domestic violence incident involved the victim’s ex-boyfriend who walked inside the Walgreens on August morning in 2017 and argued with the victim, who was the mother of his two-year-old daughter. The murder suspect asked the woman if she loved him. The victim responded, “No. I am working. Leave me alone." At that point, the alleged suspect revealed a large chef’s knife and attacked the victim with repeated stabbings. First responders found the victim bleeding on the floor and was later pronounced dead at the scene. Case 3: Orlando, Florida – The widow of a deceased man is suing the company after making accusations that Walgreens workers held her husband captive until he mopped and cleaned the bathroom inside the store. The decedent’s wife stated that her husband experienced humiliation that caused a high level of emotional distress that eventually killed him. The husband had visited the Walgreens routinely and on one incident used the store’s bathroom. Employees at Walgreens stopped the man when exiting the bathroom and escorted them back into the room telling him “you left a mess, (expletive) all over the bathroom" telling him he needed to clean up his mess. Case 4: Akron, Ohio – A disgruntled 28-year-old former employee entered a Walgreens drugstore with a gun and confronted approximately two dozen workers and customers. The shooters mother contacted police to report that her son was missing and stated he had “a history of mental health issues and was suicidal." Law enforcement was looking for the man when calls came in stating a man with the gun was inside Walgreens. The shooter had singled out the store’s Assistant Manager. The incident ended with a single gunshot when the gunman placed the revolver at his chin and fired, killing himself. He was pronounced dead at the scene. Case 5: Grove City, Ohio – A 46-year-old customer inside a Chicago suburb Walgreens drugstore began fighting with another man who produced a revolver, allegedly shooting him. Police officers took the gunman into custody but have yet to file charges. Investigators are determining whether this was a case of retaliation. Case 6: San Jose, California – An alleged robber was shot and killed in December 2017 by a security guard inside a San Jose Walgreens drugstore. The security guard notified investigators that the gunman was attempting to rob the pharmacy. The guard is cooperating with law enforcement officers during the investigation who are attempting to determine the level of justification in shooting the robber. Case 7: Englewood, Colorado – A 34-year-old alleged suspect has been charged with first-degree murder in the stabbing death of a customer. The 40-year-old victim was stabbed in the chest during an altercation that occurred in the pharmacy’s parking lot. Co-workers and friends said they are bewildered as to why any individual would want to hurt the man. Case 8: Las Vegas, Nevada – An alleged who was suspect charged with first-degree murder has pleaded guilty. The charges included a robbery that occurred back in 2014 involving the shooting death of a 58-year-old employee at the West Cheyenne Ave Walgreens store. The confessed murderer pled guilty to receive life without parole instead of going to trial with the death penalty. Case 9: Evergreen Park, Illinois – The Chicago Walgreens Drug Center was the scene of the killing where the victim was found inside his vehicle. Law enforcement officers responded to ‘shots fired’ at the S. Kenzie Ave. Walgreens drugstore in January 2017. The victim was pronounced dead at the scene. Some witnesses claimed that three males were seen running from the Walgreens store immediately after the shooting. Case 10: Chicago, Illinois – The Chicago Avenue Walgreens drugstore located near Franklin Avenue was the scene of gun violence when a shooter killed a 22-year-old man inside the store. The gunman opened fire on the victim after he just walked into the store. The decedent with head and body wounds was identified as the store’s security guard. First responders at the scene found the man dead of multiple gunshot wounds. Unfortunately, the open location of Walgreens drugstores in the local community service an available target for criminal activity that is often resulted in serious wounds and fatalities. 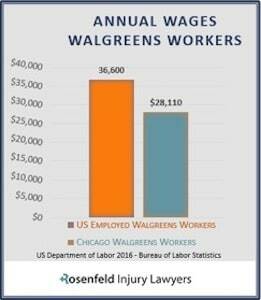 Our law firm helps injured Walgreens Workers obtain financial recovery under the IL Worker’s Compensation Act and through civil lawsuits. Call Rosenfeld Injury Lawyers (888-424-5757) today for a Free Consultation and Case Review. Our team of dedicated attorneys can cut the red tape, file necessary paperwork before deadlines, and handle your workplace injury case to ensure your family is adequately compensated for your injuries. Our lawyers can handle your Worker’s Compensation claim to ensure you receive substantial benefits and help determine if additional parties are also at fault for your harm. A seasoned lawyer could assist your family in successfully resolving your monetary compensation claim against all parties at fault. Our law firm working on your behalf can handle every aspect of the case to ensure the appropriate documentation is filed before the statute of limitations expires. No upfront retainers or fees are required because our personal injury law firm accepts every claim for compensation through contingency fee arrangements. This agreement postpones payment of legal fees until the law firm has successfully resolved the case through a negotiated out of court settlement or by winning a jury trial award. This agreement ensures you owe us nothing if we do not win!